Easily recognized but often referred to as lamb's quarters, the figleaved goosefoot is a common plant in many countries around the world. This annual plant can be confused with Atriplex patula (common orache), but this is edible as well. Figleaved goosefoot is Feigenblättriger Gänsefuß (German), Fíkjunjóli (Icelandic), Fikenmelde (Norwegian), Quenopodio con hojas de chumbera (Spanish), Chénopode à feuilles de figuier (French) and Farinello a foglie di fico in Italian. 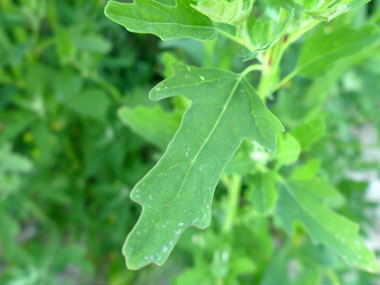 Distinguishing Features: Apart from the obvious feature of looking like a lamb's quarter, a closer examination of the leaf will show that it is different in shape. The leaves have a fig-like shape. Flowers: It is in flower from July to September (northern hemisphere), and the seeds ripen from August to October. The species is hermaphrodite and are pollinated by wind. It has an inflorescences terminal, is richly branched, panicle-like and dense. The flower has five tepals, five stamens and two stigmas. 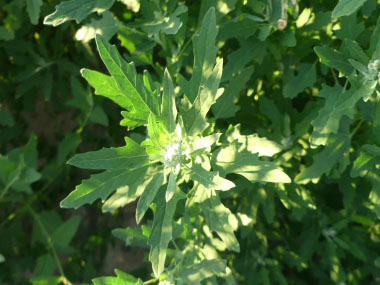 Fields of Nutrition has medicinal benefits and vitamin/mineral content of Figleaved Goosefoot. Leaves: Leaves grow alternate, are fig-shaped and the margins are smooth.They are usually light green,and the petiole measures 1 to 2o cm long. The blade has three lobes that measure 4 to 8 cm long,and are up to 4.5 cm wide at the widest point. Bracts are narrowly elliptic to lanceolate. Middle leaves have 3 dentate lobes. Height: 20 to 90 cm (up to 36 inches). The stem is subangular, striped with green, and sometimes has small red spots in the leaf axils. The main stem is erect; and the branches are mainly in the upper part. 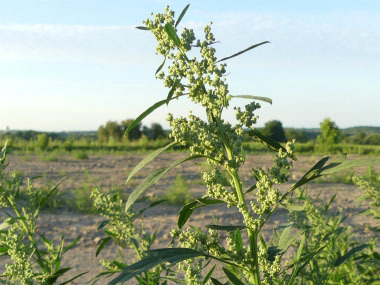 Habitat: Figleaved goosefoot likes to grow in disturbed soils and in arable land. It really likes rich soils and areas close to compost heaps. This plant grows primarily in eastern Canada, in a few of the continental states and it grows in many European, Middle East, Asian and northern African countries. It also grows in New Zealand and Australia. Edible parts: Leaves and flowers can be eaten raw or cooked although cooked is advised. Raw leaves should only be eaten in small quantities. Seeds can be roasted and eaten.